"We build the best and service the rest." Our awards, testimonials, solar organizations, and a little about Mike Tierney. 1996 "System Showcase" Award Aspen Solar Systems was awarded a national achievement award in the field of radiant-panel heating and cooling by the Radiant Panel Association. This award recognizes examples of the best installations in the radiant-heating industry nationwide. The award is designed to display to architects and the building and mechanical trades examples of the best installations in the radiant heating industry nationwide. Aspen Solar Systems won this award after a long history of developing these solar heated radiant systems in the Roaring Fork Valley and on the Western Slope. This system maximizes the benefits of low range temperatures (90-110 degrees Fahrenheit), provided by solar energy. It has tremendous opportunity for implementing into new construction. "Presidents Award" Given to Aspen Solar Systems on February 25 by the Colorado Solar Energy Industries Association, the plaque goes to individuals who demonstrate dedication to the state's solar power industry. Mike Tierney prides himself on providing quality, clean, efficient energy alternatives to consumers. He attend Colorado Mountain College's solar program and has been in the solar business on the Western Slope since 1983. The association has adopted a code of ethics to encourage quality and the latest technology for consumers. Renewable Energy Task Force Governor Roy Romer established the Renewable Energy Task Force in June 1996 to develop strategies for how Colorado can better use renewable energy resources such as the sun and wind, and for making Colorado a world center for renewable energy industries. "Coloradans want to use more renewables as a way to protect our environment. Our state's abundance of sun and wind, and our wealth of advanced technology experts can make Colorado a leader in developing and using renewable energy," said Governor Romer. "I am creating this task force to make sure that we head down that path." The 23-member task force includes representatives of the electric utility and conventional energy industries, renewable energy industries, state and local government organizations, energy users, and environmental groups. With support from OEC, the task force meets monthly to achieve their goals. Growth increases the demand for services that require energy. The "Renewable Energy Program" helps local officials, utilities and individuals identify applications of renewable energy technologies that can save money, stimulate the local economy, and help to protect the environment. CoSEIA (Colorado Solar Energy Industries Association) members are eligible to qualify for special certification ratings. These ratings enable consumers to easily identify solar contractors who have proven up-to-date qualifications in the areas of active, passive and photovoltaic solar energy systems. To obtain the "CoSEIA Certified" rating, individuals must pass a comprehensive test every 2-3 years for active, passive and/or photovoltaic solar system maintenance, repair and installation. Aspen Solar Systems has been and is now "CoSEIA Certified" for active, passive and photovoltaic solar systems. Look for the "CoSEIA Certified" rating to be assured of the highest quality services in Colorado's solar industry. 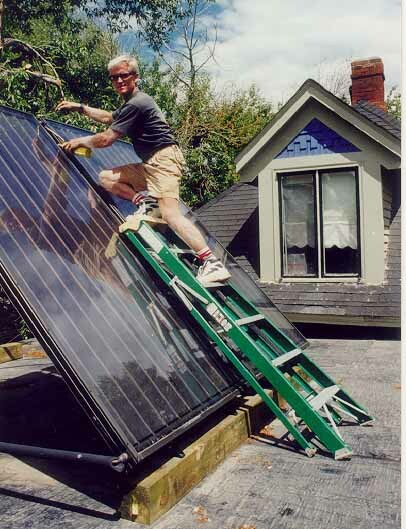 Mike Tierney, Owner Mike Tierney graduated from Colorado Mountain College in 1983 with a degree in solar technology. The company has been installing solar heating and solar electric systems for 13 years. In 1990, the company was named Solar Company of the Year for the state by the Colorado Solar Energy Industry Association. Mike has always been and continues to be a productive member of the community. Whether it is being involved with the Town Energy meetings, helping to adopt energy codes, outlining a statewide code of quality work and business ethics, and being involved in educational interests including the ASD Environmental Building, teaching 4th and 5th graders through ACES programs and hosting solar workshops through Solar Energy International.